Democratic presidential candidate Barack Obama drinks coffee while having breakfast at Pamela’s Diner in Pittsburgh in 2008. After writing about America’s favorite sandwich fillings, I started wondering what y’all were using to wash down all that bread. The answer is unexciting: tap water. But don’t close this tab so fast. The data, which is based on what more than 5,000 U.S. adults say they consumed, tells us whether Americans are drinking eight glasses of water a day, what time they drink their coffee and much else. The interviews were conducted by the Centers for Disease Control and Prevention in 2009 and 2010 as part of its most recently published National Health and Nutrition Examination Survey. Over two days, respondents were asked about everything they ate and drank. A simple count of each of these drinking occasions suggests that Americans prefer coffee over cola and apple juice over orange juice. There’s data on the volume those respondents drank. The median amount of water consumed was 548 milliliters per day (looking at just tap water, unsweetened bottled water and unsweetened, carbonated water). That’s about two glasses — nowhere near the recommended eight glasses per day (not that you necessarily need eight). With the exception of water, some of these drinks might have been consumed as ingredients in other foods and drinks. So, those results for milk in particular should be treated with a little caution. 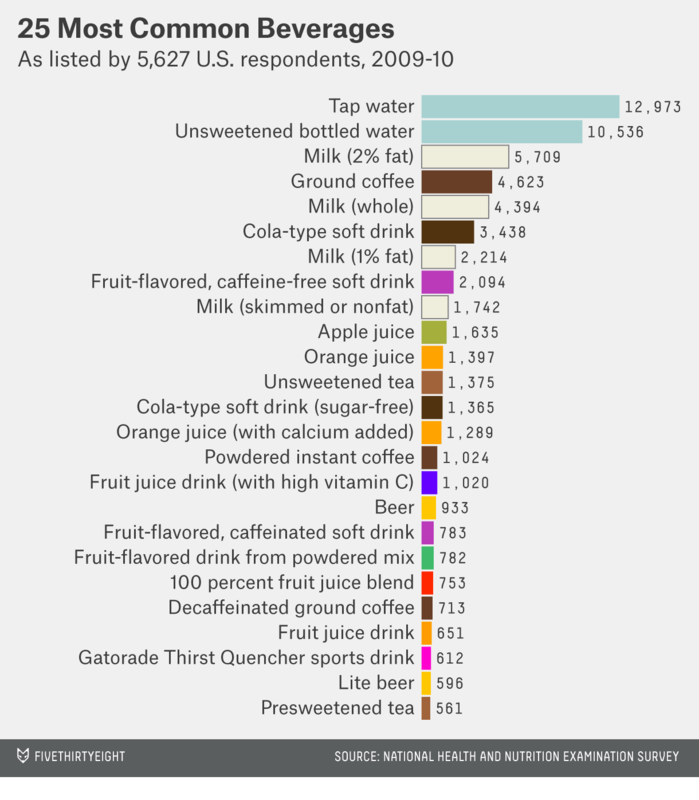 Glancing down the list, though, it’s clear this data is dominated by two things — caffeine and sugar. Let’s take a closer look at both. A median serving of coffee drank by the participants contained 121 milligrams of caffeine (we excluded decaffeinated coffee drinks.) That’s no trivial amount, given that a standard serving of Red Bull contains 77 milligrams of caffeine (although it’s nowhere near the 14,000 milligrams of caffeine that The Wall Street Journal reports might kill you). 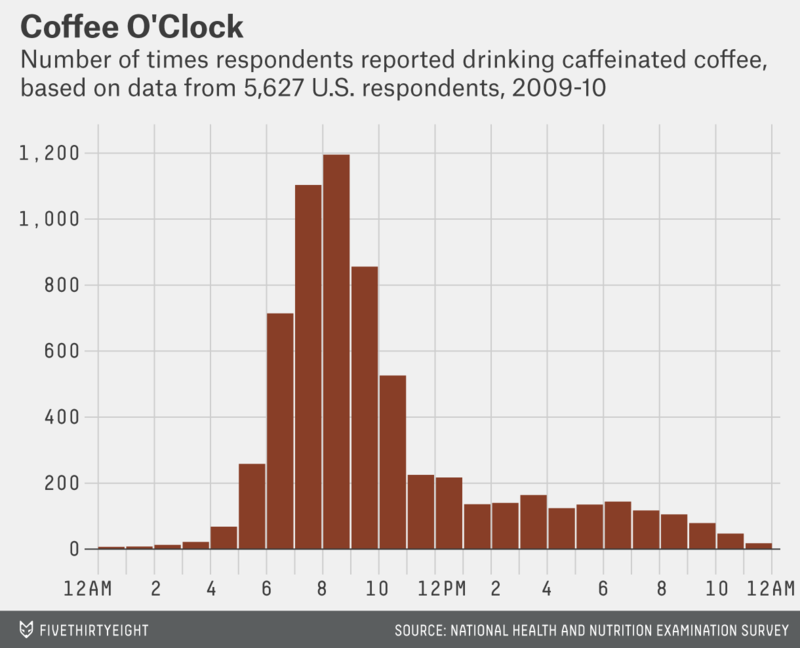 Because respondents were asked about the time they consumed each drink, it’s possible to see what time Americans grab their cup of joe. Looking at all types of caffeinated coffee, it’s clear that people want a pick-me-up between 7 and 9 a.m. That probably isn’t too surprising, but there were also some respondents who were drinking coffee into the night and early hours. Who, I wondered, might drink coffee at 9 p.m.? Respondent No. 58612 did. The survey is anonymous, so I can’t give No. 58612 a call to ask about her after-dark coffee habits, but there are some possible explanations in the demographic data. It turns out that 58612 was a 20-year-old woman who was in school. Ah. I suddenly remember my previous coffee habits — hope you made it through, 58612. 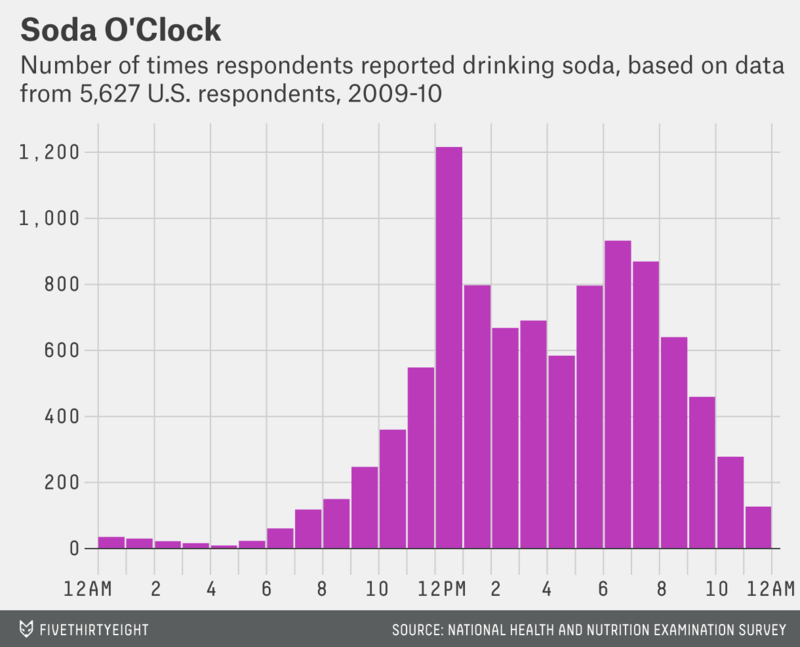 The pattern of soda consumption looks very different. Aside from a peak at lunchtime, soft-drink consumption is more evenly spread throughout the afternoon. That adds up to a whole lot of sugar. Even including soft drinks that were sugar-free, the median sugar content of those beverages was 26 grams (the World Health Organization suggests that adults consume no more than 25 grams of sugar per day). As far as alcohol is concerned, the data from these respondents confirms what we knew: Americans prefer beer to wine. I suspect that was particularly true (and this is pure speculation) for FiveThirtyEight readers on election night.